Memorial Hospital is pleased to announce its newest member of its medical staff. Monica Crim, Nurse Practitioner of Family Rural Health of La Harpe clinic will be joining the Memorial Hospital/Memorial Medical Clinic team. Monica Crim, N.P. has owned and operated the Family Rural Health Clinic of La Harpe since 2002. 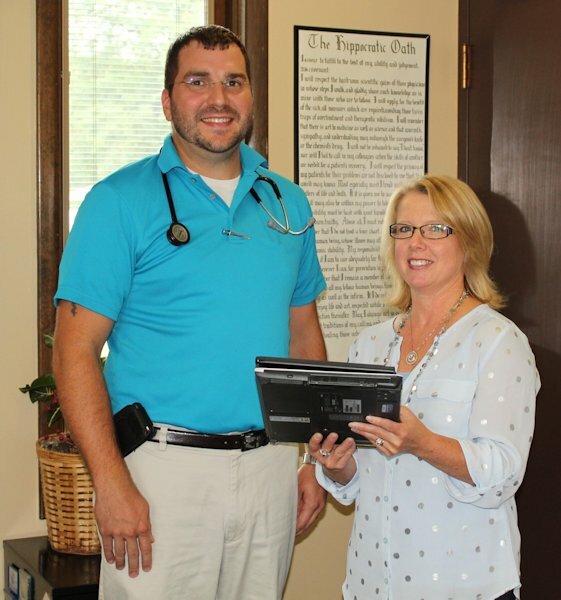 Ms. Crim will continue to provide health care at the rural health clinic in La Harpe. "I am very happy that Memorial Hospital accepted my offer of incorporating my practice into their family of clinics", said Crim, N.P. "There are many changes coming with the new health care reform, which was consuming too much of my time and resources", added Crim. "Now I can focus on my passion, which is caring for my patients and community." Memorial Hospital will acquire the practice beginning September 29. "Nothing will change from the patient's standpoint except the billing will be from Memorial Medical Clinics" says Memorial Medical Clinic Manager Stephanie Meyers. "Monica Crim brings great experience and expertise to our group", adds Meyers, "she is certified to provide DOT physicals, other physicals for children and adults, she performs simple office procedures, laceration repair, acute illness and chronic disease management, Monica sees patients of all ages and stages of life." All employees at Family Rural Health Clinic of La Harpe have been asked to stay on staff and join the Memorial Medical Clinics team. "I have been working with Monica for a little over 2 years as her collaborating physician, and I am pleased that she is joining our team", says Dr. Kurt Davis. Memorial Hospital is dedicated to improving health by providing education and wellness programs and innovative services at all the stages of life. Memorial Hospital is a 501(c)(3), non-profit critical access hospital which employs over 200, offers emergency, surgical, imaging (x-ray), laboratory, obstetrics, five clinics in Hancock County, specialty clinics and much more. The hospital has served the residents of the Hancock County area since 1950. For more information find us on the web at www.mhtlc.org.